Its been awhile since Ive been around, but I always enjoyed the feedback and help from you all. So my 99 E300 has a pretty bad oil leak coming from the rear of the engine. I cleaned up the underside yesterday, saw a plate sized puddle this morning and again later in the day after the car had been sitting for a bit. I went under again and the rear of the engine is covered in oil from the starter down and back to the where the trans meets the engine(crankshaft area). Im not sure where its coming from and cant see any oil from above around the filter canister. The valve cover gasket doesn't look like its leaking from the passenger side and cant see under the manifold either. I do see that the starter, steering components, lower bell housing and back are covered in an oil slick. Ive got some ideas, but would love to hear from you. Could it be the starter fitment, rear seal to the trans, or valve cover gasket?? Any suggestions are really helpful. 1st photo is after wiping down and "cleaning" second is after about 25 miles. There is Life After VW! Or from the oil filter housing. It attaches to the block in the same area. Also, oil cooler lines attach to the filter housing, if the oil cooler isn't located right next to the filter housing like it is on my '96. Plenty places oil could leak in that area, and from pressurized passages which might leak a lot. I agree with Greg that the oil filter housing is directly above your oil slick, so its where I'd start looking. It has a gasket between it and the block. But check the easy things first, like the big O-ring that goes around the oil filter cap. Also make sure the oil filter cap is is not cracked or cross-threaded, and is tightened down all the way. If it's not this, I'd advise removing the intake manifold to identify the source of the leak. Thanks for the ideas. I checked the canister cap and no leaks there. I did have the cross threading issue last year. Quite a mess. I'll see about getting the intake off, but I've buggered the bolt that holds the egr valve assembly to the tube from the intercooler from getting the intake off a number if times. I've tried a larger Allen bit and torx, no luck. I wonder if the whole shebang can come out if unbolt the brackets holding the tube assembly but that's another thread. The EGR valve does unbolt from the intake manifold with four E10 external torx screws. But I'm not sure how accessible they are with the manifold still in place. FWIW I replaced that pesky allen screw with a regular hex head on my car, and I find it easier to get on/off now. I vote oil filter housing/cooler lines/something in that area. Maybe valve cover gasket. Note that turbo OM606 have the oil cooler mounted in the left front corner like an OM603. Non turbo OM606 have the cooler built into the engine. I don't think it's your rear main seal. If your rear main seal was blown the oil would be further back and not all over the starter. looks like the oil filter stand is leaking. the NA 606 cooler is in the oil sump, you can see it right under the alternator. Thank gents with 3 votes for oil filter canister I'll get to taking the manifold off and see if that's it. Def a start to work with. Luckily 124zone is still up and running so found the manual on how to do it. Hopefully is that $5 gasket between the canister and block that went bad. Anyone removed the canister on a 99/98 om606? Do you find when taking slow corners or turning into parking lots after slowing down from driving speeds that the cars heating seems to go cold ? Your steering column gaiter has split and will be letting cold air enter the cabin, had this on my w210 and had cold feet and legs for weeks until I sussed it was the gaiter. Haha, great call. Ohh boy yes my feet do get cold, but at highway not at slow speeds. I always thought there was something amiss, but never bothered to see why. Not sure how to fix that, but thanks. Its quite easy to remove and fit a new one, the hardest part is getting tension on the column when tightening the clamp up as you really need three hands. Any slack equates to a slight bit of play (in and out) on the steering wheel, nothing serious but its annoying. I hope. Turns out I think it was the o-ring on the dang filter cap...again. I had the same issue similar time last year. While it says Max Torque 25nm on the cap, Im pretty sure I had tighten it down more than that and no more leaks for now. I'd been keeping an eye on that one because BTDT, but I guess not close enough. To all that wish to know, Yes you can get the intake off by removing the four bolts at the EGR mixer tube. 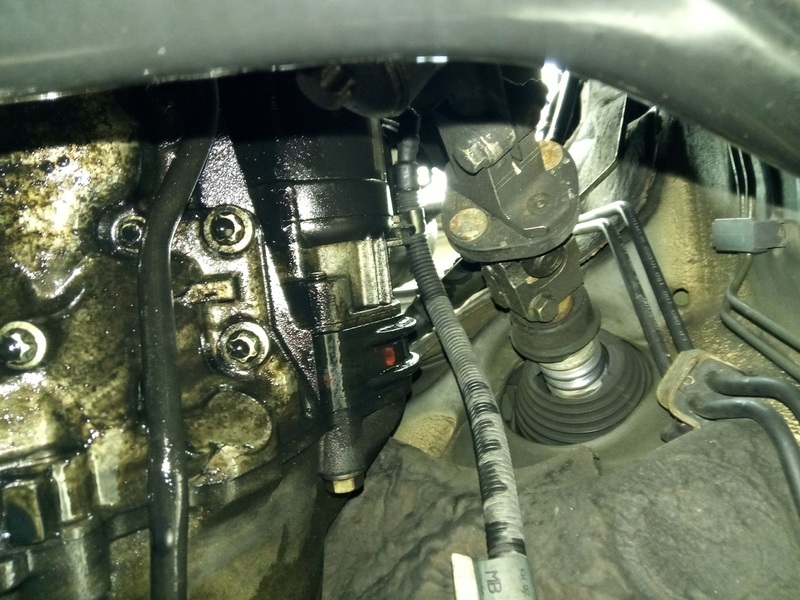 Frankly it is about as hard as it is to loosen the pesky bolt underneath the intake, getting the EGR pipe off and then getting that really pesky EGR pipe clamp back on. Get the Washer bottle out of the way and there's enough room to get ones hand in there with a 1/4" drive ratchet to loosen them off. The bolt takes an E30 Torx. Not the right way to do it but it does work. Im going to keep an eye on the driveway under the car for now, but no new spots or spills yet. you must be quite an acrobat to reach stuff without removing the main part of the intake. My popeye arms could not fit down there even if I had two elbows per arm.